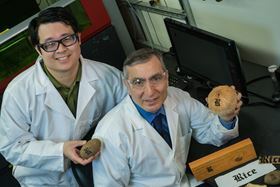 Rice University graduate student Yieu Chyan (left) and James Tour (right) holding a coconut and a potato labelled with LIG. Photo: Jeff Fitlow/Rice University. Scientists at Rice University who developed laser-induced graphene (LIG) have now enhanced their technique to produce what may become a new class of edible electronics. The Rice lab of chemist James Tour, which once turned Girl Scout cookies into graphene, has now succeeded in writing graphene patterns onto food and other materials, offering a way to quickly embed conductive identification tags and sensors into the products themselves. "This is not ink," Tour said. "This is taking the material itself and converting it into graphene." The process is an extension of the Tour lab's contention that anything with the proper carbon content can be turned into graphene. In recent years, the lab has developed and expanded upon its method for making graphene foam by using a commercial laser to transform the top layer of an inexpensive polymer film. This LIG foam consists of microscopic, cross-linked flakes of graphene, the two-dimensional form of carbon. LIG can be written into target materials in patterns and used for many applications, including as a supercapacitor, an electrocatalyst for fuel cells, radio-frequency identification (RFID) antennas and biological sensors, among other potential applications. In this new work, which is reported in ACS Nano, Tour and his team demonstrate that LIG can also be burned into paper, cardboard, cloth, coal and certain foods, even toast. "Very often, we don't see the advantage of something until we make it available," Tour said. "Perhaps all food will have a tiny RFID tag that gives you information about where it's been, how long it's been stored, its country and city of origin and the path it took to get to your table." He said LIG tags could also act as sensors for detecting Escherichia coli or other microorganisms on food. "They could light up and give you a signal that you don't want to eat this," Tour said. "All that could be placed not on a separate tag on the food, but on the food itself." Multiple laser passes with a defocused beam allowed the researchers to write LIG patterns into cloth, paper, potatoes, coconut shells and cork, as well as toast. (The bread is toasted first to ‘carbonize’ the surface.) This process happens in air at ambient temperatures. "In some cases, multiple lasing creates a two-step reaction," Tour said. "First, the laser photothermally converts the target surface into amorphous carbon. Then on subsequent passes of the laser, the selective absorption of infrared light turns the amorphous carbon into LIG. We discovered that the wavelength clearly matters." The researchers turned to multiple lasing and defocusing when they discovered that simply turning up the laser's power didn't make better graphene on a coconut or other organic materials. But adjusting the process allowed them to make a micro-supercapacitor in the shape of a Rice ‘R’ on their twice-lased coconut skin. Defocusing the laser sped up the process for many materials, as the wider beam allowed each spot on a target to be lased many times in a single raster scan. It also allowed for fine control over the product, Tour said. Defocusing allowed them to turn previously unsuitable polyetherimide into LIG. "We also found we could take bread or paper or cloth and add fire retardant to them to promote the formation of amorphous carbon," said Rice graduate student Yieu Chyan, co-lead author of the paper. "Now we're able to take all these materials and convert them directly in air without requiring a controlled atmosphere box or more complicated methods." The common element of all the targeted materials appears to be lignin, Tour said. An earlier study relied on lignin, a complex organic polymer that forms rigid cell walls, as a carbon precursor to burn LIG in oven-dried wood. Cork, coconut shells and potato skins have even higher lignin content, which made it easier to convert them into graphene. Tour said flexible, wearable electronics may be an early market for the technique. "This has applications to put conductive traces on clothing, whether you want to heat the clothing or add a sensor or conductive pattern," he said. Infusing graphene foam with materials such as plastic, rubber and cement produces tough composites with a wide range of possible applications. Scientists have developed a simple way to produce a conductive graphene foam that they can shape into 3D objects such as battery electrodes. Download the full text PDF, for free.